Sally Gethin is an expert on inflight entertainment and connectivity. She edits Gethin’s Inflight News, an independent subscription monthly report and also blogs on the IFEC industry at www.gethinsinflight.com. Here she reports on an area of the air travel market which is, for the most part, is lacking in inflight wi-fi and connectivity in Europe. But that could change. As usual Michael O’Leary, CEO of Ryanair, drew plenty of laughs with his urban street theatre on the podium of the World Low Cost Airlines Congress (WLAC), organised by Terrapin at Heathrow’s Sofitel Hotel earlier this month. Slouching the lowest into his comfy seat like an arrogant teenager at his parent’s table featuring other premier league players including Willie Walsh, CEO of IAG, Pieter Elbers, Chief Operating Officer CEO of KLM, and Frode Foss, who holds the same position at Norwegian Air Shuttle, he fired off a series of shots about the cost of paying the hotel rates to attend ‘to Willie’s convenience just outside his office at f---g Heathrow’ and asked if next year the conference could take place at a ‘low cost shed at Stansted’ instead. But despite the posturing in some ways O’Leary had his back up against the wall, now the large airlines are launching a series of no-frills low cost subsidiaries to regain control and supremacy of the global airline market. At least, that was the biggest theme at all the sessions at WLAC. As O’Leary said in an oblique compliment to the likes of BA and other rivals of Ryanair, ‘… we drive the agenda and the high fare airlines are clever enough and switched on enough to copy a lot of what we do because it’s the way forward”. It certainly is a mad mad world when the large legacy airlines spawn their own young of the likes of Ryanair at the risk of cannibalising themselves. Laughter aside, the talk was all about the birthing of low cost carriers by the legacies at this year’s conference. Time after time, speakers addressed the audience with plans of how and why they are launching. The world of airlines is generally regarded as highly cyclical. But now the industry is literally coming round full circle. What has prompted this? Is it purely a smash and grab by low costs that has given the legacies a bloody nose but come out stronger? Willie Walsh pointed to a range of catalysts, including new variable costs which were previously fixed, freeing them up to become more nimble. But legacies still respond badly to "short term shocks" he said citing the ash cloud phenomenon which had a devastating impact on large airlines. Whatever the reasons, when a legacy carrier decides to launch a long haul low cost version of itself, the product could end up being a highly sophisticated hybrid. Norwegian Air Shuttle says its new subsidiary Norwegian Long-Haul will fly direct to New York for just US$150. Air France is launching HOP! Could these new low fare operators turn out to be a leaner meaner version of their parents? 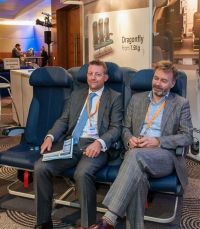 KLM said it was not starting with a blank sheet as people might expect, but was using its inherent expertise and experience to create a new model. Elbers said, "We are confident in transforming part of our business into a sustainable model." WLAC co-located with AirXperience and AviationIT”. And this exposed a fault line within the industry on attitudes to new revenues. At WLAC I noted a general malaise when the term ‘ancillary revenues’ arose. 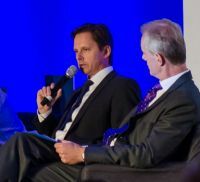 I was rather shocked to hear misguided comments by some airline leaders on the business case and technologies for inflight wi-fi and passenger connectivity. Willie Walsh even went so far as to call inflight connectivity in ‘beta max’ mode implying it was still a primitive developing onboard technology. He is at least five years possibly 10 years behind in his understanding. Any recent airline adopter of inflight connectivity knows it is hugging a precious secret. In the United States wi-fi technology is rolling out on a vast scale. Here in Europe and in the rest of the world it is still a misunderstood yet emerging trend. Inflight connectivity, where passengers can switch on their own devices and get access to the internet and send and receive emails, let alone GSM roaming onboard enabling passengers can make voice calls and SMS messaging on this side of the Atlantic, is in the ascendancy and certainly not in beta max mode. Norwegian Air Shuttle (NAS) which offers a ku band inflight wi-fi service from Row 44 throughout its fleet said that it was "a great success", "definitely something to offer", and that 60% of passengers onboard are using it. Even though NAS is providing it for free, the airline sees it as a worthwhile airline differentiator. That is because a shedload of revenues can be made off the back of inflight wi-fi which clearly is a reality lost on the likes of BA and Ryanair. Both BA and Ryanair for example aborted their own wi-fi and inflght passenger connectivity trials several years ago with the exception of a single aircraft in BA’s case flying from London City to New York. There is a real lack of recognition at the top of airlines – be they legacy or low fare – as to the commercial power of adopting wi-fi onboard and opening the door to a raft of new revenues. At WLAC it was clear that airlines are still encased in an ancillary revenue paradigm based on the existing model of charging for baggage, meals, or additional amenities. Duty-free continues to prevail as the overriding exception to this rule, but even this established revenue stream is not yet harnessing the new emerging technologies of in-flight retail linked into ground based data systems leveraging onboard wireless networks and satellite technologies. At least, when I moderated a round table on the Onboard Experience at AirXperience, that was the clear message. AirXperience gave rise to a new wave of these suppliers and service providers who attended this year and these are driving the real hidden agenda of new models for commercial revenues forward. And in the case of large airlines imitating their enemies, this at least creates a fresh impetus, and a much-needed new pressure on the low-fare business model. In short, the legacies are about to reclaim vast tracts of terrain from their younger rivals.